A professor, determined to unearth a 16th-century culture buried in Morganton’s foothills, discovers the first Spanish fort in the interior United States. On a side road in the hills between Marion and Morganton, just past the farm supply store and around the bend, a dirt driveway snakes between a cornfield and a tree nursery. It looks like the type of place you might go for a bluegrass festival or a pig pickin’. But it was here this summer that a team of archaeologists uncovered the site of the oldest European fort in the inland United States. It’s a breakthrough that could shed light on a short-lived period of North Carolina history still shrouded in mystery. David Moore and his two assistants are here digging. A professor at Warren Wilson College in Swannanoa, Moore is every bit the archaeologist — a lanky man in his 50s wearing jeans, boots, and a faded blue mechanic’s shirt. Long strands of hair frame a weather-beaten face under a broad-brimmed hat. The answers are in the soils, he says, stooping to scrape the ground with a trowel. He reveals a sandy-colored outline a few yards wide in the middle of a trench of dark mud. To most people, the trench looks like a well-groomed sand castle. But Moore sees the outline of a moat. Moore has been digging and scraping these fields since 1986. That’s when, as a doctoral student at the University of North Carolina at Chapel Hill, he set out to prove that American Indians had lived and farmed here in the rich bottomlands of the upper Catawba Valley in the 16th century. He’d searched several sites, but many landowners turned down his request to dig on their property. James and Pat Berry were among the few who said yes. Moore is still here. Every summer. Braving heat, heavy rain, and thunder to slowly fill in the gaps of knowledge about North Carolina before the Lost Colony. The Spanish language feels new to the North Carolina foothills. But its speakers have made their presence known — from La Noticia on the newsstand at the Morganton Food Lion to the garage on College Street converted into a store, Tienda y Tortilleria La Esperanza. That last word, esperanza, means “hope.” For 20 years now, migrants from Mexico and Guatemala have come to the foothills seeking a better life on the poultry farms and in the furniture factories that once covered the landscape. Today, about 16 percent of Morganton’s population is Hispanic. Long before the English language made its way here, the voices of Spanish soldiers echoed through the hills. They came here from Santa Elena, on what is now Parris Island in South Carolina, where the Spaniards had recently set up colonial operations after ousting the French from Charlesfort. Gov. Pedro Menendez ordered an expedition through the interior to open a route to Spanish colonies in Mexico. More than 120 men in armor with their menacing dogs and matchlock muskets marched along ancient trading trails from town to town. They carried little food and relied on the townspeople along the way. Their leader, Juan Pardo, read a prepared speech at each stop, declaring the natives subjects of Spain. It’s not clear how much, if any, the tribes understood of the Indian language spoken by the translator, a French boy named Rufin, whom the Spaniards had captured at Charlesfort. The men had hopes of their own. Hopes for silver and gold and the favor of the king. The men moved farther inland up the ever-larger foothills until they saw the ridgeline. Beyond those mountains, they believed, was a quick route to the silver mines of Mexico. But the snowcaps in the distance looked foreboding. They came to the town of Joara and decided to stop for the winter. Relations with the Indians started off peaceful. The Spaniards ate well. Pardo and his men built a fort and some outbuildings at the edge of the town. They named it Fort San Juan. After a few weeks, Pardo reported back to Santa Elena, leaving around 30 men posted at the fort and Sgt. Hernando Moyano in charge. Unlike Pardo, Moyano wasn’t one for keeping records. He wrote a letter here and a letter there. He was more interested in the gold, silver, and crystal he had heard were buried in those hills. And that lack of records is why, today, this dig is so painstaking, and so important. Rob Beck has deep roots in these foothills. The land grants for his family’s farms in Burke and McDowell counties date back to King George III in the early 1770s. But he was always interested in what came before. Before the Scots-Irish and German settlers. Before Revolutionary War General Daniel Morgan, who lent his name to the town Morganton. Before the fenced farms and hosiery mills. People knew about the Indian mounds around the area. They belonged to the loose-knit tribes along the river who, weakened by war, disease, and a century and a half of intensive white settlement, banded together as the Catawba Nation in the mid-1700s. But Beck doesn’t remember hearing much about them in school in the 1970s and 1980s. He learned more by exploring the fields and forests, by picking up arrowheads and fragments of pottery. With each new discovery, he rushed to the McDowell County Public Library to match it with the photos in archaeological tomes. “It amazed me,” Beck says. “I could find the exact same kind of pottery in those books that I just found in a field in Marion or a field in Morganton. So Beck was excited when he heard that an archaeologist from Chapel Hill planned to work on his aunt Pat and uncle James Berry’s land. Beck watched David Moore dig at the site. Moore quickly found what he was looking for — evidence of a large 16th-century American Indian town. By 1994, Beck’s early interest in arrowheads had become a career. One January day, he was poking around at the Berry site, dormant since Moore’s work eight years before, when he found what looked like European pottery. Researchers confirmed the pottery as Spanish. Beck called up David Moore, who by then had begun teaching at Warren Wilson. Moore had found some European pottery during his Ph.D. days there, too, though researchers had told him it was 18th-century Moravian. The two men compared their finds — it was an exact match. It’s not clear why the Indians of Joara agreed to help the Spaniards, Moore says. The memory of Hernando de Soto’s more violent expedition through the valley 20 years before might have made them feel they had no choice. Or they might have believed they were entering into a long-term trading relationship. Whatever the reason, Moyano seems to have forged an alliance of sorts with Chief Joara. The Indians helped him prospect for crystal and gold, and he provided the Indians with military protection. In spring 1567, Moyano even aided their attack on the rival Chisca tribe across the mountains in present-day Tennessee. But by the end of the year, relations between the Spaniards and the Indians grew tense. Pardo, who had returned to the valley from Santa Elena to colonize townships, heard rumors of Indian plots to resist. Some Spaniards observed that their countrymen in the interior made unreasonable demands for food and had “indiscretions” with Indian women, angering local chiefs. In late November 1567, Pardo left Fort San Juan for the last time. By that spring, reports reached Santa Elena of an uprising and the destruction of interior forts. Only one Spaniard survived the attack. Since the discovery of Spanish pottery in 1994, Beck, Moore, and a host of other archaeologists have been gradually digging up new information about what happened during those 18 months more than four centuries ago. In the late 1990s, along with the late Thomas Hargrove, they found evidence of the underground remains of four burned buildings where they now believe the Spanish soldiers lived. Digging deeper, Moore and Beck, now joined by Tulane professor Chris Rodning, have found glass beads, chain mail armor, olive jars, and wooden timbers — all clues to daily life. This summer, the team set out to follow that outline of light-colored soil. They thought it was the southern boundary of an Indian mound. On what was supposed to be the last day of excavation in July, Beck says, they noticed the soil didn’t curve where an Indian mound should. Tests showed the ground below was deeper than expected. Chester DePratter, an archaeologist from the University of South Carolina who had excavated the Spanish forts on Santa Elena and the French Charlesfort, happened to be at the Berry site. He said the details looked the same as those on the coastal forts. “That meant the world,” Beck says. More digging, and the team discovered an 111/2-foot-wide, 6-foot-deep moat. “There was a lot of euphoria when we realized we had what we thought we had,” Beck says. The discovery of the fort opens new questions. Just how big was it? What happened within its walls? Did the Indians build a mound on top of the burned fort as a way of reasserting their claim to the land? The team will spend the coming years looking for answers. Some answers we know. Moyano never found that gold. Pardo never returned to the interior. The Spaniards abandoned Santa Elena in 1587, retreating to St. Augustine, Florida, and leaving Carolina coasts open for other colonial powers. That same year, English ships landed on Roanoke Island. 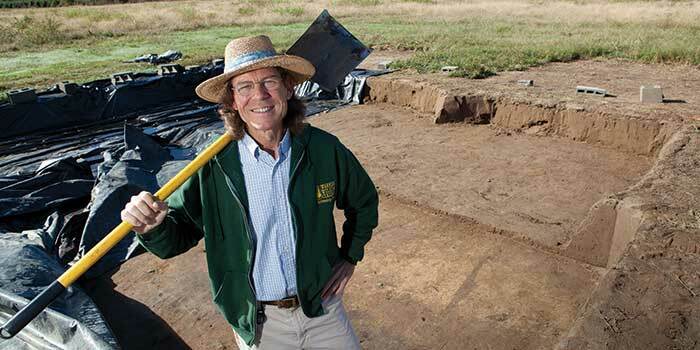 Since 2001, David Moore and his colleagues have led a summer archaeological field school at the site, which allows students to experience a dig firsthand. The Exploring Joara Foundation sponsors the school and is also working on a public archaeology site at the Catawba Meadows Park in Morganton. It will include replicas of Catawba Indian town buildings and living history demonstrations. For more information, visit exploringjoara.org. The archaeological site is closed during the winter and early spring, but will reopen in June. For information on available dates to visit, go to exploringjoara.org.